Glorious Leader: Sorry Not Sorry I'm Not Presidential - Joe.My.God. 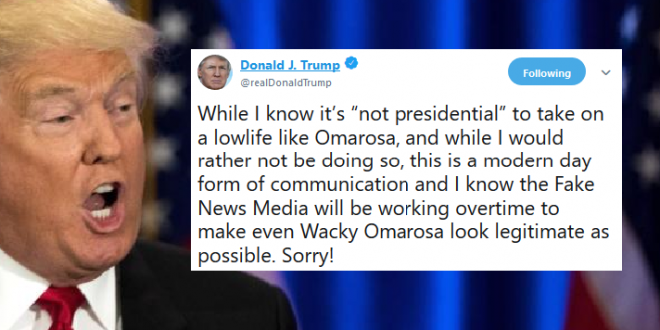 President Trump just gave Omarosa Manigault Newman the gift of another news cycle. Trump tweeted a scathing criticism of his former top-level aide just as her book-promoting media tour was gaining steam, all but guaranteeing the kind of made-for-cable feud that made them both reality TV stars and ultimately brought them to the White House. Given this assessment, one might ask why Manigault Newman was given the high-ranking title “assistant to the president” with pay of $179,700 a year.